The wonderful USA-made cover from Thirsties called Thirsties Duo. 2 sizes. Snaps or Hook and Loop for a newborn? New H/L size one in blackbird on a 6 week old baby over a newborn orange edge Cloth-eez prefold diaper. The new H/L is taller and bigger than the old version, which makes it stronger and more durable, but on a tiny baby the size of it is a noticeable difference. The Snap version is more popular for newborns. This picture is a good representation of the actual fit of the new H/L on a new baby. It is nice to have choices so you can choose which style you prefer. I, Karen, generally like snaps for a newborn because snaps are only 1/4 inch tall and new babies are very curly people. They bring their knees up to chest like they were in the womb. Some babies startle with the sound of opening the hook and loop style closure and snaps are quieter to use. But hook and loop is faster to use. It's just a choice. Both kinds work. With either kind, if you prefer a smoother look, and a nicer fit at the legs, fold up the fabric where the rise snaps are in the upward direction. A note about fit: I (Karen) think this is on too tightly in my opinion. I'd go up a rise setting on this little one. 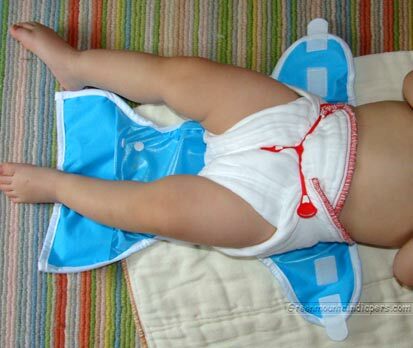 At the next higher rise setting I'd set the diaper and cover higher in the back and keep it low in the front. The high in the back placement lets the hook and loop come around and down more, thus preventing the slight pinching of the tummy I see here. 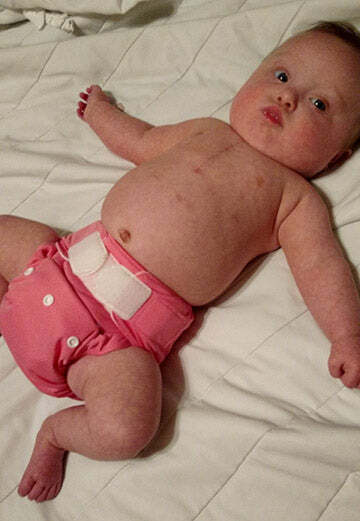 If you have tummy pinching or feel that baby is outgrowing the cover far too soon, try setting the diaper and the cover higher in the back and lower in the front and be sure to pull up the diaper between the legs well so the leg elastic is seated correctly on the legs and not way down across the thighs. 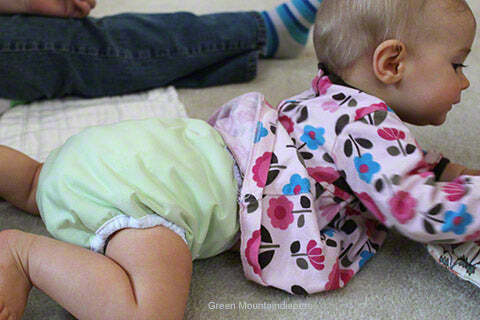 Play around with how you are setting the diaper to figure out how to get the best fit on your baby. It is amazing how changing the front to back angle changes the way various covers fit. Different people and babies have different opinions about how tight or loose it should be. It is definitely possible to put on hook and loop closures so that it is comfortable and effective. 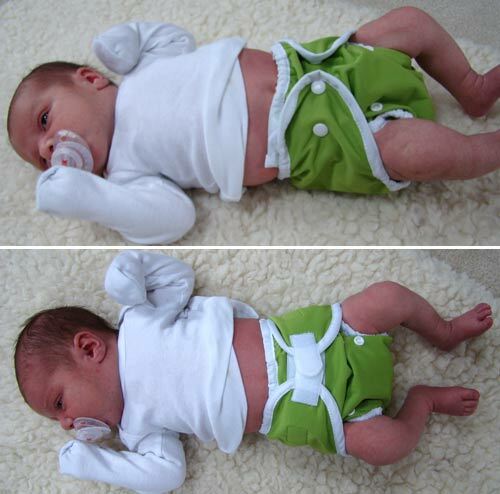 It is possible to put any type diaper of diaper on so that it is either too tight or too loose, or on comfortably, of course. Proper fit and proper adjustment is important for both leak prevention and comfort, with all brands, kinds and sizes of diapers. This celery cover below shows how Karen likes to set the diaper high in the back. This is just my choice. It may not be how you like to do it! A lot of people will prefer to have it snugger in the back and that is ok. As you look at the many pictures on this page and around the site you will see many different ways that people do it and prefer it on their babies. Do what works for you. This is one of the great benefits of the two-size Thirsties Duo. You really can adjust it to be just the way you like it to fit your baby. The Thirsties Duo in snap closure is our most popular, best-selling cover. Size 2 Snap in celery on lowest rise setting on a 15 pound baby over medium Workhorse diaper. 5 months old in size 2, snap version set at smallest rise and current version of hook and loop shown on mountain range print set at medium rise. Generally, the hook and loop version looks neater but the snaps can be more comfortable, but preferences vary. Snaps last longer than hook and loop does in the wash. The snap version out-sells the hook and loop version by a lot - so snaps are often preferred. Snappi fastened red edge Cloth-eez prefold is underneath. Nothing to fold down. It fits perfectly. (Original Hook and Loop shown) She also fits the Bummis Super Whisper Wrap in Medium. The Thirsties Medium is a bit big on her, since she's on the thin side. See more pictures of this toddler for comparisons. 14 pounds in size 2 hook and loop closure on medium rise setting. This shows the new, current hook and loop closure which is taller and more sturdy than the original Aplix shown in some pictures on this page. Help us replace the old pictures with new, current ones. Email you pictures to karen at support@greenmountaindiapers.com. Thank you! 4 months old, 15 pounds, in Size One Thirsties Duo Wrap hook and loop closure over a size small yellow edge Cloth-eez prefold diaper. Sleeping through a diaper change. 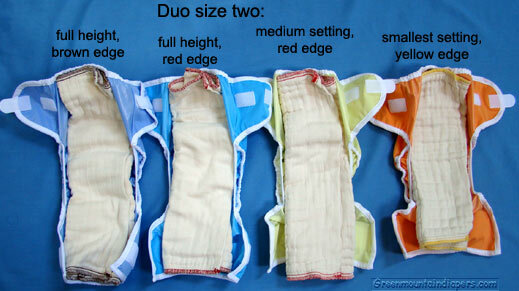 Shown over a no-closure Workhorse diaper size newborn, pinned. Same baby as above 6 days old. Preemie's first day home 5 pounds 3 ounces. Size one Duo looks big, but it doesn't leak. Preemie baby, 5 pounds 8 ounces. The trick to making this work on such a little one is using a preemie prefold underneath it. (Original Aplix shown). See more pictures of preemies. 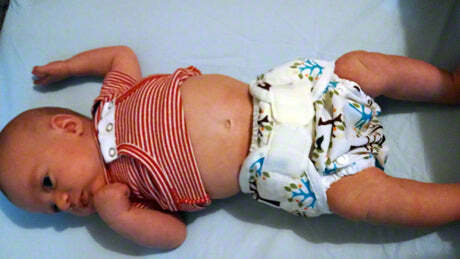 Preemie twins just home at about 4.5 to 5 pounds in Thirsties Duo size 1 over a size small/one-size birdseye flat diaper. A half size flat would be trimmer, but with all that cotton of the small/one-size flat in there to absorb, there are no leaks even though the cover is still so roomy. They are comfortable and leak-free. 2 weeks old, 8 pounds, 6 ounces, medium height setting, size one in the Original Aplix version. Comparison of snap version above on the same baby. The pictures below show how the prefolds fit in the covers at the various settings. It's hard to picture, though, without actually putting it on a baby, because they go on the baby differently than they lay out, but here are pictures anyhow for reference. 10 months old, 19 pounds, Duo size 2 at medium rise setting over medium red edge Cloth-eez prefold Snappi fastened. Note from Karen: I think these run a little smaller than the suggested size range, especially the size one. I think size one is 5 to 14 or so pounds. It seems to me they they will fit until the yellow edge is outgrown. Yellow edge fit perfectly in them with the rise unsnapped. Snapped down, they fit orange edge. 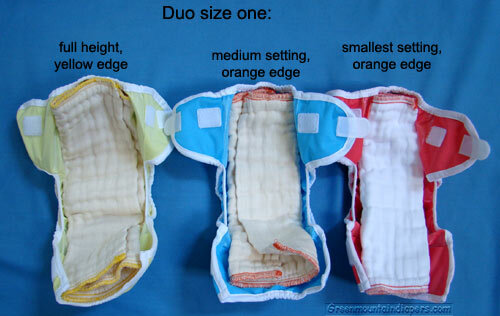 The size one Duo is smaller than a Thirsties cover size small. They are trim so I really like them over unpinned prefolds, but I personally prefer a fuller cut cover for fuller-fitting at the hips styled diapers like fitteds or pinned prefold, but they do still work over them, as you can see from the size 1 orchid purple on the baby above and the red edge snappied in size 2 above. It's a style preference. For size two, I'm guessing the fit is 14 pounds up to 30+ pounds, fits red edge or brown edge Cloth-eez prefolds. On the smallest rise you can fit yellow edge in them fine, if you want to size up covers a bit sooner than 15 pounds it might work depending on shape of baby. These do not run the same as Thirsties covers. The rise at full height of size Two Duo is in between a Thirsties medium and large, and the waist width is narrower than a Thirsties medium (less likely to need to crossover tabs!). The fit is trimmer in style at the hips. That is, the height of the material is less a the hips, mostly because the width is less so you don't bring the so much material around to the front because the tabs don't need to go in as far because it's narrower - if you can picture that. It's a bit more shaped like the Bummis Super Brite, but not the same, but definitely in the same "fit style family" as the Super Brite, I think. If you have pics you are willing to let GMD put up on this page, please send them in. It will really help others figure this out. One thing is for sure - they are a different pattern. They did not take the Thirsties covers and add snaps. The lovely fabric and gusset the same, but the fit is narrower and trimmer. It's very nice. It works well over unfastened prefolds, although you can definitely fasten the prefold underneath this. For thin or average shaped babies, it will probably fit over just about anything except very tall and full cut fitted diapers. It will fit over most though, just like the Bummis Supers fit over most fitteds also. An excellent cover. Hook and Loop or Snaps? They are different. Other brand names of hook and loop closures are Velcro or Touchtape. Snaps are 1/4 inch tall but the H/L is 1 inch tall across the front. That front height of the closure changes the fit a just a bit. Also the snaps version fits a little wider than the H/L version because the H/L can crossover the tabs to a smaller smallest setting. With one row of snaps, it's quick-fastening for a snap cover, but generally the H/L style is faster to put on and take off. I tend to like snaps better because my babies have fat bellies that roll forward when they sit up. To me, the one row of snaps seems to be more comfortable for baby because of it's small 1/4 inch snap height, thus it digs into baby's belly less. The baby fat rolls around the snaps easily. Also, I never get a scratch from snaps. But, overall the fit with H/L is usually nicer and looks nicer. The front of the H/L cover lays better. The corners of fabric near snaps can pull back a bit and not lay as flat as the H/L kind, thus appearing less neat. But I still prefer snaps for my baby's comfort. Another factor in the choice is what you are putting underneath it. If using prefolds and you don't fasten, the H/L holds the prefold better probably because of the 1 inch tall size of the fastening area - there's more there to hold the diaper in place. You can still use a prefold unfastened under the snap version anyhow, though, but H/L is usually preferred for unfastened (trifolding) prefolds. 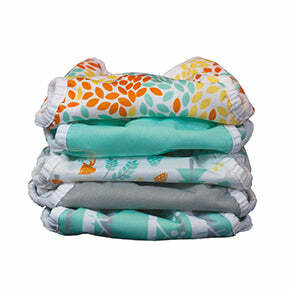 If fastening the prefold or using a fitted diaper then that difference is not a factor. It's just a style preference really. These are minor differences, really. (This is true for other brands of covers as well). Sometimes chubby babies fit snaps closures better and thin babies fit hook and loop style closures better. Snaps, when opened and closed properly and not yanked and abused, will usually outlast hook and loop closures because over time hook and loop takes a beating in the wash. Aplix is more popular overall, probably because it's a little quicker and easier to use. Choose the closure you prefer. Aspen Grove print in size one on a 2 month old. Either closure is fine. Try both to see which you prefer. Choose snap or Aplix (Aplix brand hook and loop closure with snap height adjustment). 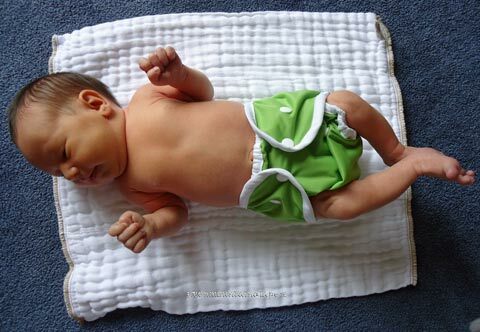 The snap version is our most popular diaper cover. Don't forget to add your 16 page GMD How-To Booklet to you cart. It's a treasure-trove of information and it's free with your order.